Can Georgia earn a win at Notre Dame with a true freshman starting his first game? Jacob Eason had some major ups and downs last year as a freshman quarterback for Georgia. The Bulldogs went a pedestrian 8-5 in Kirby Smart’s debut season. This spring, many wondered if Eason or incoming freshman Jake Fromm was the right long-term answer for the program. In the season opener against Appalachian State, Eason struggled in his first two series. The sophomore wasn’t able to get comfortable and never found a rhythm. On his third series, Eason suffered a late hit out of bounds and he was ruled out for the game. Enter true freshman Jake Fromm. After finishing Eason’s drive with a punt, Fromm then led Georgia to touchdowns on three straight drives. All of the drives lasted just four plays. Fromm looked cool and collected and the team seemed to rally around his energy. Fromm did a very good job running the offense, which flowed quicker and smoother than it had while Eason was in the game. In his college football debut, he showed a lot of positives in the game against the Mountaineers. The devil’s advocate point of view will tell you that Fromm had the benefit of coming off the bench in an unexpected situation. He was able to come in and just play. He didn’t have to sit around for a week and think about the fact that he was the starter. He also got the benefit of playing against a team that doesn’t have the talent of the next team on the schedule. Appalachian State is a good program. The Mountaineers have proven in the past that they are not to be overlooked. They also shouldn’t be able to compete with a program like Georgia due to depth. Now Georgia must travel to Notre Dame for its first northern road game since 1965 and must do so with a true freshman at quarterback. The playbook will be shortened with Fromm at the helm instead of Eason. If the Bulldogs had their choice, they would want to go into this game with the experience of Eason but having Fromm isn’t a huge downgrade. In a hostile environment and with a week to think about it, how Fromm handles the noise and his ability to sustain drives will be major tipping points in this game. However, the major question mark at the quarterback position could come into play if something happens to Fromm. 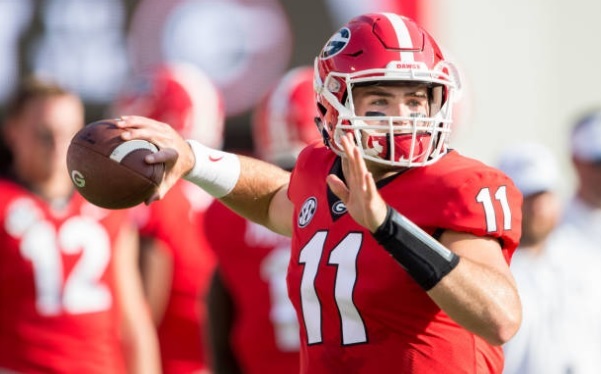 If Fromm goes down, then it could be a disaster scenario for Georgia. A bright side for Georgia coming out of the Appalachian State game was the play of the defense. Georgia’s defense completely shut down the Mountaineers and would have pitched a shutout if it wasn’t for two untimely interceptions from their third-string quarterback. Kirby Smart’s defense will face a much stiffer test against Notre Dame, but Georgia will go into the game confident that its defense will keep them in the game no matter how the offense plays. The key for the defense on Saturday will be to stay disciplined against Irish quarterback Brandon Wimbush, who is very adept with his feet. Jake Fromm has a huge undertaking on his hands as he leads his team to South Bend. Despite what you might think, the freshman will not win or lose this game for Georgia. It will be Georgia’s inexperienced offensive line that will be the difference between a win and a loss for Georgia. The offensive line started poorly against App State, but Nick Chubb and Sony Michel took full advantage once they started opening some small holes. It always seems to come down to the offensive line for Georgia. Fromm has arguably the best 1-2 backfield punch in the country. He also has a future All-American at tight end in Isaac Nauta. If the offensive line can open up some holes and get decent protection for Fromm, then this should be Georgia’s game to lose. If they can’t, then it’s going to be a very long day for the freshman QB and the Georgia fanbase.